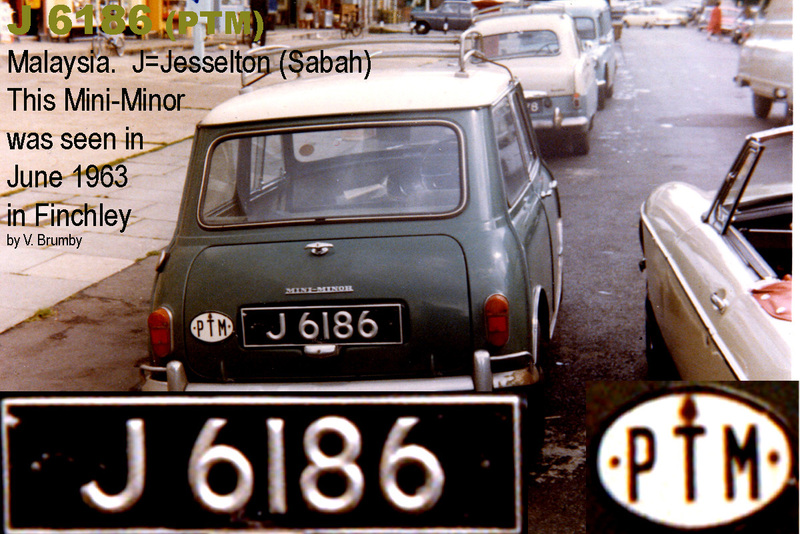 This entry was posted on Saturday, November 17th, 2012 at 8:28 pm and is filed under Borneo, Historic, Malaysia, Sabah, Sarawak. You can follow any responses to this entry through the RSS 2.0 feed. You can leave a response, or trackback from your own site. 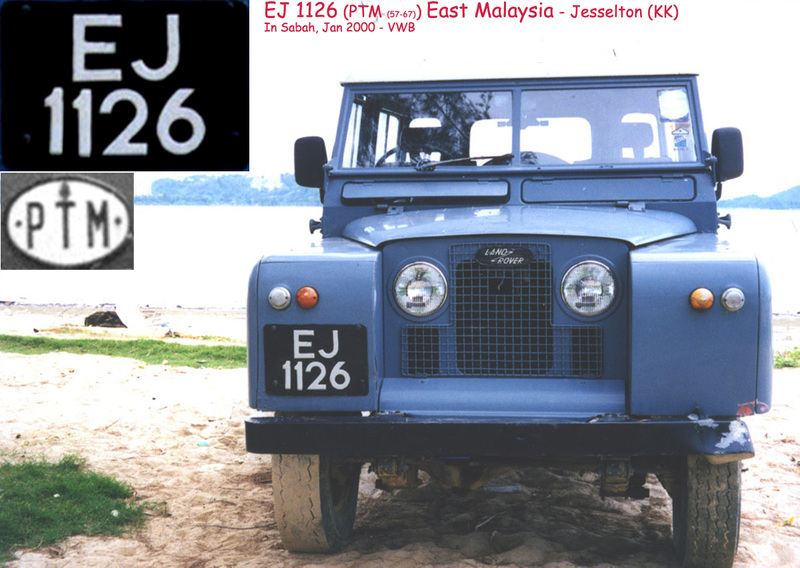 John Pemberton has written back to us today to say that the Jesselton plate J 3500 illustrated in this post, was collected ‘out East’ by his pal Roger before 1970, but he has never known what vehicle it came from. John also mentions a few of the photos he has taken over the years, which I hope to scan for display on the Europlate Blog in future. In Britain, he saw (but didn’t photograph) Indian royal household plate NAVANAGAR STATE 2 (in Karnataka) – but he did catch BMY 7797 on camera – a rare sight of an Indian in UK. Others include Iraq (Kirkuk), Trieste, Angola – ANC…., Mozambique – LM….., Uruguay – Maldonado and Montevideo, Gold Coast – C…, Turkey – Adapazari 1st. H, Gambia – G…, Nigeria – CM (Cameroons), Straits Settlements – Penang, Tanganyike – DSD…, Ceylon – CY…, Nyasaland – BT…., a 1947 USVI – T 14 – and China (Mongolia). John asks us if we could solve a sixty-year-old puzzle for him, by identifying the origin of an Indian plate, the letters of which he carefully transcribed, and is sure, are accurately portrayed. The copy of the script is on a separate Post, named Pemberton. Can you help? THank you Dan – a kind thought. 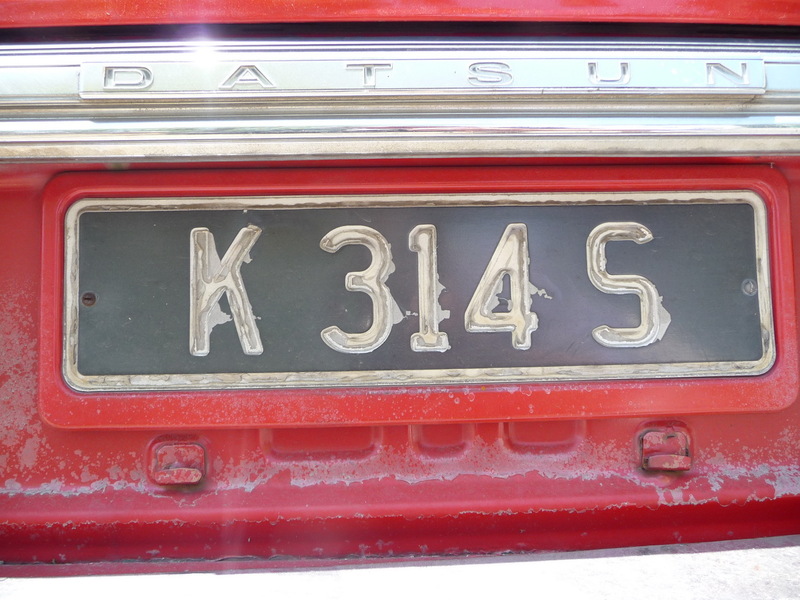 I would like to have the plate for safekeeping in the Europlate archive of memorabilia. Perhaps a Jiffybag in the post would convey it OK and I will naturally pay the postage. Presumably your uncle was out in Malaya in the 1950s? And perhaps brought a car home with him. You might even find a photo thereof!